Which 4 Backpack Vacuum Cleaners Work Best? Backpack vacuums are lightweight machines that strap to your back during use. They are very portable in design offering many advantages over larger upright and canister style cleaners. You typically get enough attachments for all floor types, as well as tools for cleaning any ‘above the floor’ surface you would encounter in a typical home (or office building). Most people are not aware that you can actually get the indoor environment just as clean as with more typical full sized canisters but in a much different way. The only surface it will struggle with is thick, high pile carpets so if your home contains them you will need another cleaner to at least supplement this one. 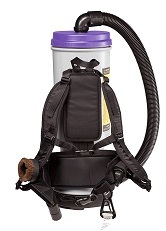 The first generation backpack vacuum was quite basic in design, without much in the way of filtration or power. It was a good choice for quick cleaning of office buildings where you weren’t necessarily worried about getting every little dust particle up. However, many things have changed since then and a lot of technology is built into the current generation. Now you can find these vacuums outfitted with a HEPA filter, quick sealing dust bags, and long electric cords so you are getting the best performance you need for even the largest of spaces. If you are looking for the highest rated model then the ProTeam lineup has to be at the top of the list. They have many professional users in the cleaning industry but they are starting to tap into the residential area as well. This is due in part to such studies as the one conducted by the ISSA worldwide cleaning association which stated that ProTeam backpack vacuums can clean a 2,500 square foot building in around 20 minutes. 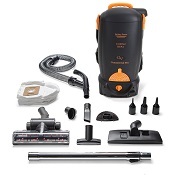 The ProTeam Super CoachVac commercial grade vacuum comes with a huge list of features for a relatively inexpensive purchase price. With a weight of around 11 lbs., it is much lower than the typical 20 lbs. weight of full sized upright and canister cleaners. The adjustable harness is designed to distribute this weight evenly across the center of your body so it feels quite light, even during extended use. They also recommend keeping the cylinder close to your body so it cannot catch on items as you move around. Other highlights include the large capacity of 10 quarts, a 17 inch crevice tool for reaching deep into furniture, a 50 foot extension cord, a long reach telescopic wand, and a soft dusting brush for delicate surfaces like curtains or lampshades. The CoachVac has their Xover floor tool which allows you to clean lower pile carpeting and hard floors, but it won’t be able to get dirt and dust mites out of thicker carpets. ProTeam cleaners also come with HEPA filters which are rated at removing 99.97% of microscopic allergens from the air before pushing it back out. For more information and to check current pricing on their lineup, click here to visit our recommended online supplier. Another great (and less expensive) option is the Hoover Commercial C2401 Shoulder Vac Pro. 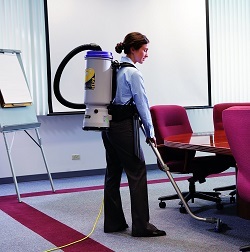 Hoover is a well known manufacturer of both uprights and canisters but they also have a capable backpack vacuum lineup. 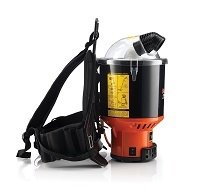 The Shoulder Vac Pro compares well with the more expensive models, falling a bit short in capacity and overall reach. It comes with the ability to hold 6.4 quarts of debris which is much less than the ProTeam above, but still more than enough for the average household. The chiropractor designed harness spreads the weight around to virtually eliminate any shoulder or back pain during use. Other features include a 48 foot electrical cord, a cleaning accessory pack with a variety of tools for all surfaces, and extra insulation to give a quiet operation even at max power. You also get a cone HEPA filter that can remove almost all micro organisms like dust mites, mold spores, pet dander, and pollen. The 11 inch turbo tool can handle lower pile rugs as well but again, will fall short of those with thicker rugs to clean. These backpacks are a very popular choice among cleaning pros as well as homeowners who need a versatile, portable cleaner. Click here to visit our recommended ecommerce store for consumer reviews and current shipping options. The most surprising quality of this Bissell is the powerful suction that the 1,080 watt Ametek motor provides. It can deep clean pet hair from carpets at a surprising rate. The filtration also works well as you will notice the exhaust is clean and free of even the smallest of dirt particles. Overall it is a commercial quality machine that comes with a residential price-tag. Click here to read online customer reviews and check pricing. This may be the best backpack vacuum cleaner that you haven’t heard of. The GV model has full HEPA filtration to remove virtually all of the smallest of allergens including pet dander, mold spores, and pollen from the air before it is expelled back into the room. This is important for asthma and allergy sufferers to prevent a reaction when breathing indoors. Allergens tend to scatter around your home or workplace on a regular basis so it’s important to clean with the right model that can completely remove them. Probably the biggest attraction to the GV is it is a cordless unit. The rechargeable lithium ion battery is tested to run for approximately one hour when fully charged. That is impressive considering it only takes around 2 hours to charge when plugged in. This gives you complete portability and a big advantage over the electrical or ‘plugged’ vacuums. The suction also stays constant as the battery is draining which is a major improvement that the lithium ion technology has over prior generation batteries that would slowly diminish in power. The GV is a great choice for those looking for a cordless backpack at a much lower cost than the competition. It is highly rated by customers and comes with a 2 year warranty that is backed by the company. You also get a lot of on-board attachments including an air driven brushroll with power nozzle, several different sized tools, and a stainless extension wand. Click here to visit our favorite supplier to learn more about it. It’s easy to see how versatile backpack vacuums are. They are lightweight and strap right to your back so you can easily carry them up and down stairs, or outdoors if needed. If you have a variety of floors and surfaces, and want a fast cleaning machine then a backpack model is a great choice. This assumes that you do not have high pile, thicker carpets as these cleaners simply cannot pull embedded dirt from deep down in the fibers. For that you will need a full sized upright or canister that has more power.